I don't usually think of myself as an obsessive person. I think I'm both too easily bored and too lazy to really cultivate obsessions. But I have to admit that my liking for garter stitch knitting does border on obsession. My knitting over the last few weeks has taken garter stitch geometry to a new level of preoccupation (a nice euphemism for obsession). There's the log cabin squares I've already written about. You knit one square and then knitters know what happens next. One square leads to another - 'this time I'll just adjust the size of the commencing square; this time I'll make the borders of different depths; this time I'll do some stripes' - and in a relatively short time I'd finished four squares. That was when I finally had to face up to the fact that I didn't have nearly enough yarn to finish a blanket or throw of any useful size and that the yarn had been discontinued. So I tried all the usual suppliers for this yarn - in Australia, in the USA, in the UK, in Canada, and while most of them had some balls of the Mission Falls 1824 cotton at wonderfully discounted prices, most of them didn't have the colours I needed. Then Ravelry came to the rescue. I posted that I was looking for this yarn and various helpful people sent me the results of systematic searches they had made through Ravelry stashes. As an outcome, after a number of suitably apologetic and beseeching emails to Ravellers, I assembled my yarn. This blanket or throw when finished will have more airmiles and postage attached to it than anyone would think possible. Bits of yarn came from Canada; some from the USA; some from interstate; and some after a car trip to Berry on the south coast. Perhaps this has been a bit obsessive after all. But even the squares have had to make way for another garter stitch binge. Along with some friends and members of the Inner City branch of the NSW Knitters Guild we're making a string of bunting*. 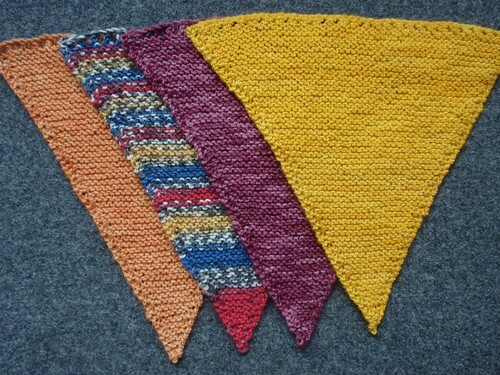 This is a kind of double obsession for me - not only garter stitch but also bunting. It follows on from the cloth bunting I made for a Christmas swap and the Bye Baby Bunting cardi I knitted for a colleague's new baby. So, I'm sharing with knitting friends an obsession for knitting triangular garter stitch flags (bunts) from sock wool scraps. They're breaking out over twitter and facebook in plains and stripes and even quarters. Great fun. There's even an emerging vocabulary. The flags themselves are bunts. People knitting them are bunters. The obsession is bunterism. I think we're going to have a very long, very varied string of bunting. 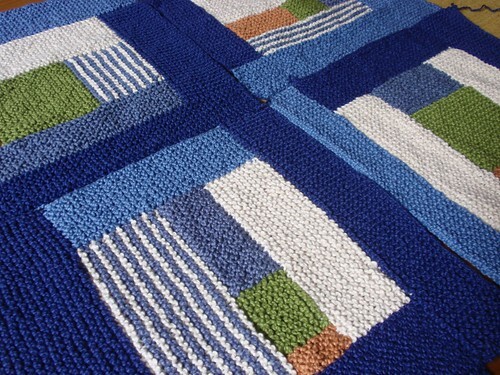 So my current knitting switches between log cabin squares and bunts. Very geometric. Very neat. Lots and lots of garter stitch. I imagine I'll tire of all this repetitive garter stitch sometime, but just for the moment it's very satisfying. * In case you're interested in sharing the bunting craze, we're using an adaptation of Karen Wessel's pattern - casting on 55 stitches rather than the 35 of the original pattern as we want the bunting to draw attention to itself. I'm rather fond of garter stitch knitting myself! I've just finished a garter stitch blanket, have one in intarsia on the needles and am knitting a garter stitch shawl in a bouclé yarn! I can't wait to see the log cabin done, I think it will look magnificent (I love those colours together!). You are the first bunter I have ever known. Thanks for enlightening me. i was so inspired by the display on saturday that ive taken up bunterism myself, even tho i said i wouldnt. i can see how its kind of addictive. i want to try it in all sorts of yarn now. also, the log cabin is gorgeous! The log cabin is gorgeous and it's great when Ravelry can unearth the yarn you need or want. As for the bunting it is becoming quite the trend. They are going to look fabulous. I am currently stalled part way through number 7 in wool/silk. I love the log cabin and I applaud your tenacity in gathering all the yarn. As for the bunts - what can one say? My obsession shows no sign of flagging! I'm with DrK... I was adamant I could resist the bunting but I am too weak. All the bunts are lovely, but I especially love that bright yellow bunt!